Meet our favorite new lever chain hoist, the LA series by AMH. Why do we love these hoists so much? For starters, they have a great build quality. The operation is smooth, the labeling is very clear--in fact, each hoist is dual rated for both US and Metric tons. The load chain is made from Grade 80 steel right here in the U.S.A., and each hoist is assembled and tested in the U.S.A. as well. 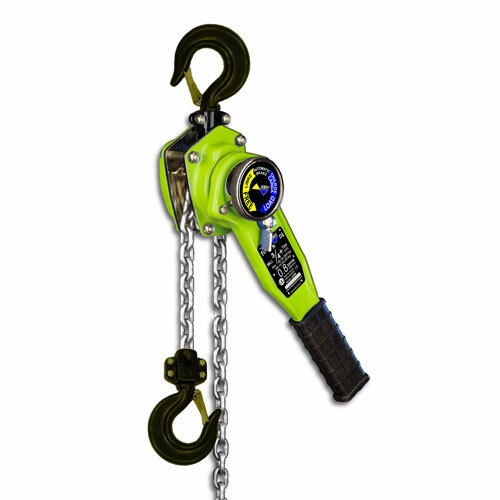 You can now order these hoists with overload protection for a nominal fee. Overload protection means that once the hoist has exceeded maximum lift capacity, a one directional clutch is engaged that will only slip in the lift direction--the load can only be lowered at this point. This safety feature is becoming more and more common to help users avoid the dangerous conditions encountered when lifting products are used beyond their intended capacity. Premium Grade 80 zinc-plated alloy load chain is made in the U.S.A.